Schaumburg, IL - (August 16, 2011) - TAIYO YUDEN CO., LTD. has announced details of the commercial release of two new products expanding its lineup of BR Series power inductors. The new wire-wound power inductor products are the BRL1608, measuring 1.6 mm x 0.8 mm with a maximum height of 0.7 mm, and the BRC2012, measuring 2.0 mm x 1.2 mm with a maximum height of 1.4 mm, for DC-DC converter applications in smartphones, cell phones, digital still cameras and other compact mobile devices. With the BRL1608 wire - wound chip power inductor, Taiyo Yuden has achieved an industry-leading thinness of 0.7 mm. Compared with the existing BRC1608, measuring 1.6 mm x 0.8 mm with a maximum height of 1.0 mm, the BRL1608 realizes a reduction in height by 30%. On the other hand, when placed against the existing BRC2016, measuring 2.0 mm x 1.6 mm with a maximum height of 1.8 mm, the BRL2012 delivers an approximate 42% reduction in volume ratio size. Complementing this cutback in size and height, the BRL1608, with 0.13Ù at an inductance of 1ìH, lowers DC resistance by approximately 28% when compared with conventional products. The BRC2012, with 0.060Ù at 1ìH, also delivers approximately 29% lower DC resistance than the previous product. Taking these factors into consideration, Taiyo Yuden is confident that each product will contribute to reductions in mobile device size, thickness and power consumption. Production began in May 2010 at an output pace of 20 million units per month for both products. The price of samples is $0.20 per unit for each type. 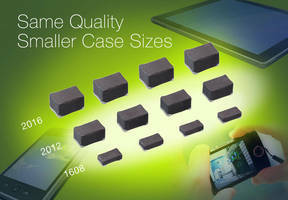 In light of the significant shift toward multi-function, higher performance smartphones, cell phones, portable music players, digital still cameras and other compact mobile devices, the demand for smaller, slimmer and high-efficiency power inductors for DC-DC converters that help to reduce size while lowering power consumption continues to increase. In addition, the need for thinner power inductors for boost converters that fulfill an LCD driver IC's higher current requirements is particularly strong when considering the use of larger, higher resolution LCDs in each of the aforementioned compact mobile devices. Taiyo Yuden has risen to this challenge. The company had already endeavored to maximize efficiency in the BR Series by employing single-sided electrode terminals for its underlying ferrite core structure and materials of wire-wound inductors. The launch of these new inductors further optimizes efficiency. As a result, Taiyo Yuden has brought to the market the BRL1608 EIA 0603 size wire-wound chip power inductor that achieves an industry-leading thinness of 0.7 mm, and the BRC2012, which reduces the volume ratio size by 42% when compared with the company's conventional products. Looking ahead, Taiyo Yuden will continue to develop products that match market needs. In this regard, the company is committed to realizing innovative new product development advances in wire-wound power inductors. Now in its 61st year, Tokyo-based TAIYO YUDEN CO., LTD. is a worldwide manufacturer of surface-mount and leaded passive components, wireless modules and components, energy device, SAW/ FBAR devices. The company's North American affiliate, TAIYO YUDEN (U.S.A.), INC., operates sales and engineering offices in Chicago IL, Boston MA, Raleigh NC, Irving TX, Denver CO and in California at San Jose and San Diego, and Ontario Canada. For more information, visit www.t-yuden.com, or contact TAIYO YUDEN (U.S.A.) INC., 10 N. Martingale Rd., Suite 575, Schaumburg, IL 60173, Phone: (847) 925-0888, E-mail: sales@t-yuden.com.